Craig Scott is in the top 20 individual points scorers in the EPL. The Lithuanian star hit the net twice in as many games as Phantoms completed a three-day double against struggling Bracknell in the English Premier League. 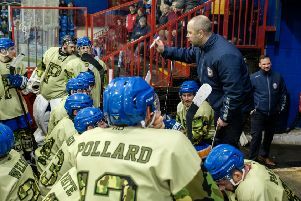 The city men were taken to overtime before wrestling a 3-2 success in Berkshire last Thursday night and they followed up with a hard-fought 5-2 triumph on home ice 48 hours later. Speaking after the second of those victories, Pliskauskas admitted: “We were sluggish in the first two periods, but we did the right things in the third period to win the game. “We didn’t play particularly well in Bracknell either and that is something we need to try to put right. “We have been too slow to every loose puck lately and we haven’t been taking the puck to the net well enough. “It is not possible to play brilliant hockey in every game in such a long season. It is about doing everything you can to win. Pliskauskas is refusing to get carried away by Phantoms’ fine position at the EPL. Only an inferior head-to-head record against fellow pacesetters Milton Keynes currently keeps them off top spot. But Phantoms do boast five games in hand on their fiercest rivals and also possess one game in hand on third-placed Basingstoke, who are a point behind them in the standings. “It doesn’t matter about our league position at this stage of the season,” continued Pliskauskas, a senior international for Lithuanian since the turn of the century. “It is too early to get excited because we have a lot of hockey ahead of us. “We just have to focus on producing the best performance we can every time we go on the ice. Pliskauskas has now racked up more than a century of points in just under two years as a Phantoms player. He was coach Slava Koulikov’s first signing when following his boss from Slough in December, 2013. Pliskauskas is one of two Phantoms players to feature in the top-20 individual points-scorers in the EPL so far this season, according to official statistics. He is 14th on the list with 13 goals and 16 assists for a total of 29 points – three behind team-mate Craig Scott who has contributed eight goals and 24 assists to date for 32 points.